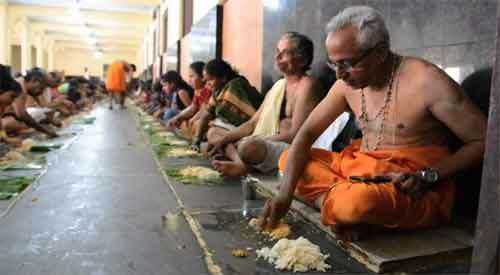 The food provided for free to thousands of devotees daily at the Udupi Temple in Karnataka is the best. 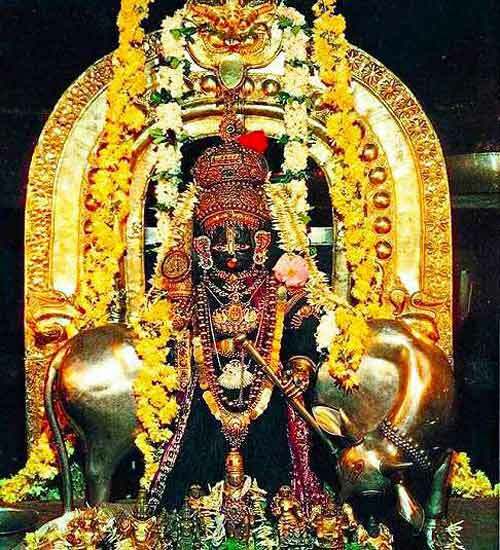 The food is Prasadam (holy) which has the blessing of Lord Krishna who is worshipped in the Udupi Sri Krishna Temple in the form of Bala Krishna (child innocent Krishna) holding butter in one hand. Udupi temple food is vegetarian and satwik. There are no onions and garlic in the food. The food is mainly prepared using whole grains and vegetables. The main course usually includes rice, sambar, rasam, vegetable side dishes, sweets (payasm) and ghee. Udupi temple food is famous for its chutneys. The most famous being the one prepared using the skin of ridge gourd. The vegetable curries in the temple are prepared using root vegetables. Side dishes and curries are also prepared using banana and colocasia. The use of seasonal fruits like jackfruit makes the food special. An important item served in the temple during lunch is gojjus. It is prepared using pineapple, brinjal or bitter gourd. A spicy sweet sour gravy with grounded sesame seeds, coconut, jaggery and other spices that flavor the pineapple or bitter gourd. The food served regularly includes popular items like pakoras, chutneys, kosambari salads. The ingredients used are seasonal. Parayaya Swami’s kitchen (chawki) – for the pontiff who heads the temple for 2.5 years. For invited guests, Brahmins, scholars and donors there is the second kitchen known as mristanna. Food is served here for these people. Food for general public is served in the Bhojanashala. Daily around 5000 people eat the prasadam offered by the temple. The number of devotees swells to 30000 or more during festivals and other important religious functions like the Paryaya. The food is served on a banana leaf. A meal is finished in less than 30 minutes. Cleaners sweep through the floor clearing banana leaves and cleaning the ground for the next set of serving.